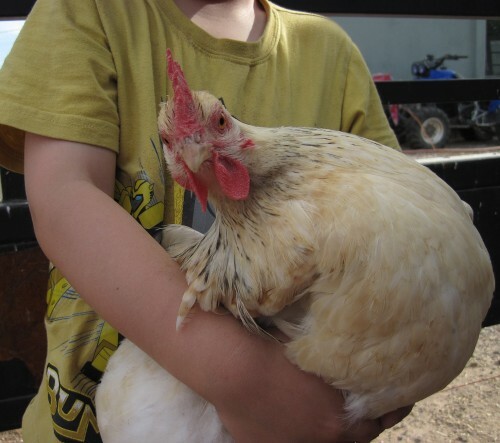 Blog Home | Chicken Behavior | Docile chickens: What is docile? When I first started raising chickens, one of my biggest concerns was how they would interact with each other, and my family. Everyone has seen the cartoon hen who bullies the flock, or has heard stories about the aggressive rooster who attacks whenever you step into the barnyard. I wanted to make sure to get docile chickens. While there is some truth to those characterizations, I’ve found those sorts of behaviors are far less common than I had previously believed. Most hens (and roosters) are pretty laid back: you go about your business, the flock will do the same. Still, even with years of chicken keeping and plenty of successes (and failures! ), I choose carefully before adding a new breed into my flock, so I can have docile chickens and a docile flock overall. With small children in the house, I make sure any new breed I add is docile. But really, what is docile when it comes to chickens? This is one of our docile chickens, for sure! 2. Readily trained or taught; teachable. 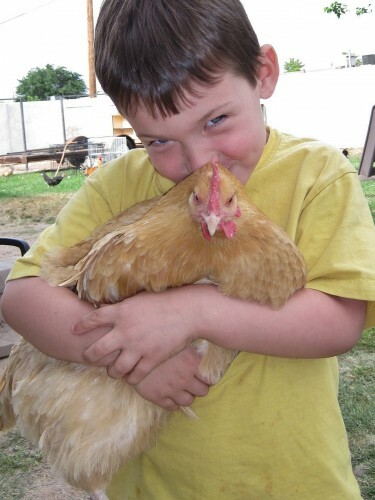 When it comes to chickens, though, docile does not mean the chicken will want to be held, snuggled, or otherwise cuddled. 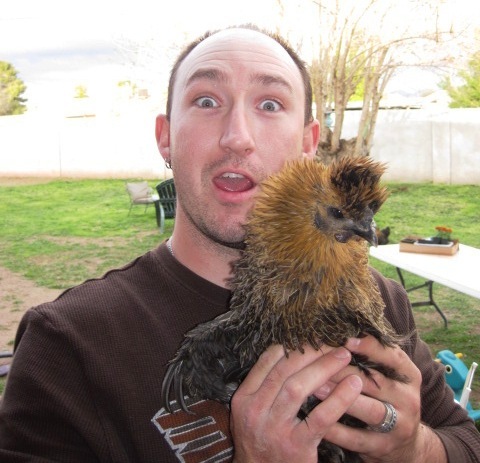 In general, docile chickens can be handled easily. A docile chicken be picked up, caught, and examined without too much fuss. This is helpful if you need to do quick health check, examine a wound, or move a wayward bird back to the coop. If a breed is truly docile, you would be able approach most hens and roosters of the breed without having them darting away, or fly up into a tree, or scream like a banshee. Of course, some hens do like to be cuddled. Think of it as a special bonus! Love, love me do! You know I love you! Some docile chickens like more than cuddles. Here you can see Runt, getting a dust-bath spa treatment from my husband. If you sat down in the yard, she would sit in front of you, waiting to be buried. 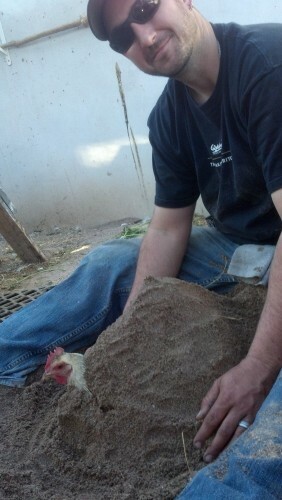 You never knew just how much chickens loved dust bathing, did you? Not just Runt, either. 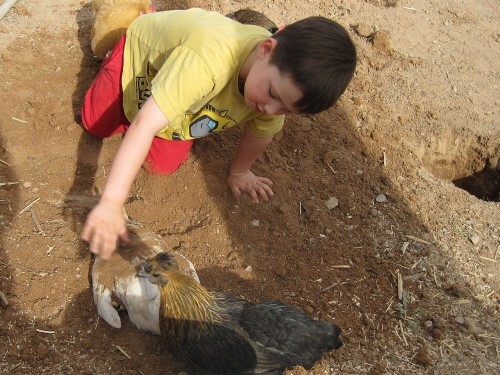 Our entire flock of docile chickens would line up, if the kids were playing in the sand. Because who doesn’t love playing in a sandbox? Docile also means you should be able to train the chicken, fairly easily. The word “train” might be a little misleading. Even though it turns out that chickens are better than toddlers at math, it’s still unlikely you’ll be able to train a bird to do calculate differential equations, perform tricks on command, or ride a tricycle. I suspect a chicken that can out-math me would be more trouble than it is worth, anyway. We can’t believe you plotted that Bessel Function all wrong! In many cases, you should be able to train a docile breed to come when called or go into the coop if necessary. Like most animals, the easiest way to achieve this is through food. Need your hens to follow you into the coop? Keep a coffee can of scratch by the back door. Every time you put the chickens to bed, pick up the can and shake it while you walk to the coop. When you get into the coop or run, toss down some scratch. Eventually, you’ll find most of your hens will go running to the coop as soon as they see you reach for the can, or hear the scratch shaking around. This might be helpful if you need to lock up the chickens before dark, or if a predator is near. Of course, chickens are individuals, and in my flock, there are always those special few outliers who don’t like people, don’t like being handled, and don’t like other chickens. They aren’t necessarily a good reflection of the breed as a whole, they just do their own thing. Just like people! On the flip side, there are plenty of “non-docile” breeds who will make great members to your flock. I’ve had (supposed) aggressive game birds want nothing more than to be carried around in my hoodie. So when you are choosing new breeds for your flock, docility is something to consider, but the lack of the “docile” label doesn’t have to be a deal-breaker. Have you had a chance to check out our breed selector tool yet? It is a great way to see which breeds we consider the most docile. Our book, My Pet Chicken Handbook, has an even more detailed chart of each breed’s typical characteristics. Have you had an especially friendly, manageable bird? Which breeds have been your favorites, so far? This past summer, I received speckled sussex, australorps, a silkie, and a white leghorn, and I chose them for their “docile” qualities except the leghorn. While they are all great family members, one of the australorps wants nothing to do with me and the leghorn, which I thought would be quite flighty and unfriendly, has turned out to be the gem of the bunch. She will ride around on my shoulder, sits on my lap for cuddles.. is more like a cat than a chicken! i have a 4 month old welsummer rooster and would love to tame him just a little – i donated his “brother” to an ag class at the middle school and the kids spoiled him – I am concerned that due to his size he may be a little too heavy for the hens – they’re all pretty good sized except for his little sister – should he be housed separately from the hens? Roosters do tend to be larger than hens in any breed. Typical large fowl roosters can mate even with bantams the size of silkies. Is there some special concern you have with this particular rooster? Is he significantly larger than a normal rooster, for instance? I have 7 black australorp chickens that are 8 weeks old. They come running when I rattle a bag of party mix, but they won’t let me touch them. I picked them up a few times when they were still a couple weeks old, but not daily or anything. Will they tend to get more tolerant of handling, or does that need to be established when they are still really young? When I was a kid growing up in rural Phoenix, Ariz. We kids had some Leghorns that the local hatchery would give children in the area for the asking..they were all special pets..we played with them constantly and they got so they would follow us down the street! They loved sitting in our laps..they were so cuddley!! I don’t remember if they were roosters or hens but they sure were good little pets!! My black australorps are calmer than at 1st but still want their distance (no touch or holding) at about 2.5 moths. My older Cuckoo Marans will let me pet her. My Easter Egger is calm but wants her distance (no touch or holding). My sweetest young Leghorn hen was killed. She’d let me pet her and seemed to enjoy the interaction. The one young Leghorn rooster I have left doesn’t want to be touched but will crow if you call his name and come toward you to see if you have treats. I just ordered orpingtons, a Blue Laced Red Wyandotte, a Golden Comet, and another Easter Egger. We will see how well they will do in personality and eggs. I’d get another Leghorn but think netting would be best if I keep any more of them.